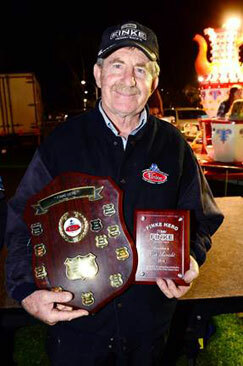 As the Finke Desert Race enters its 5th decade, the enormous effort and resourcefulness by local volunteers remains one of the town’s outstanding achievements. But for all the effort and meticulous planning, managing the safety and behaviour of the 15,000 strong crowd along the track is the one issue that keeps organisers on edge all weekend when competitors, just metres away, race past them at speeds of up to 200 kilometres an hour. The fact is, the whole race is operating on a knife’s edge: One serious injury to a spectator, or worst case, a fatality, would mean the event is shut down, says Finke Desert Race Club president Antony Yoffa (at right, with Grid Girl Jade Sharpe). The club has no control over what people do along most of the land traversed by the race – a collage of pastoral leases, stock routes, public roads and Crown land. “Someone high on booze or hooch or whatever, standing too close to the track and stretching out his hand to take a photo, he or she could become the cause for banning of the event,” says Mr Yoffa. The club has an ongoing “Don’t be the Reason” campaign, including talks to hundreds of school children, year after year. In a way, that a major mishap to a spectator hasn’t happened is a sign of the good will and the maturity of the Finke crowd – but it may also be just good luck. He says there have been preliminary talks with the NT Government to re-route part of the event through a corridor, maybe 300 metres wide, along the eastern boundary of the Owen Springs reserve, which is owned by the government. Other sections could be along a road reserve where crowd control can be exercised. 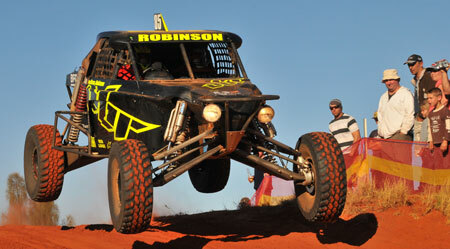 The club turns over three quarters of a million dollars every time it runs the annual off-road classic. Many of the facilities at the start / finish line were paid for from profits – and with a lot of help from tradies who are members of the club. The Finke pumps $5m into the local economy. It is run by 319 highly disciplined volunteers, many of them with decades of experience of the complex, top-level event conducted under the sharp eye of the national motor sport regulators. A core group of volunteers are now preparing for the 42nd run of the race, on the Queen’s Birthday – nay, The Finke weekend – next year. The club has just one paid employee – and she is part-time. It has a highly stable management. For example, Mr Yoffa is in his 14th year as president and has “ambitious plans to further develop the event”. And he knows what The Finke is all about; not as a remote bureaucrat but as someone who’s competed in the race, on motorbikes, 11 times, and finished nine times, earning himself nine of the coveted Old Ghan dog spikes. These “spikes” are only awarded to finishers of this gruelling event. AT LEFT: 2016 Finke Hero Glen Auricht showing the club’s award presented to its outstanding volunteers. The volunteers have demanding and sometimes arduous tasks – and love them. Sleeping out in near-zero temperatures at a checkpoint or fuel stop is all great. “It’s the most fun you can have with a Finke vest on,” says Mr Yoffa. The jobs include back-up time keeping: each competitor carries a transponder which records their progress past the checkpoints through to the finish. But volunteers with pencil, paper and time clock have to stand by in case the GPS based system fails. Other volunteers look after such tasks as communication, safety, mechanical back-up, sweep vehicles and fuelling along the track, providing entertainment, manning the bar, and other facilities for the crowd at both ends of the track. All that the race needs is now located at the start / finish line at the Alice end, including the Friday night scrutineering of vehicles along with riders’ and drivers’ gear. This year long-term Finke identity Judi Hoare, former president and one of four life members, co-ordinated all the other 318 volunteers by personally contacting them, and assigning them to one of 35 teams. The team leaders, in turn, were responsible for their group of volunteers and kept Ms Hoare aware of their preparations throughout the lead up to the event. She kept the committee, which meets every second Tuesday all year ’round, updated on her “super team,” says Mr Yoffa. The volunteers have precise job descriptions. Only as many volunteers are recruited as there are actual jobs needed to be done. And then of course there are the St John Ambulance, Police, Emergency Services and Norforce, as well as a gaggle of stall holders. The cordial but arm’s length distance from government works well for the club. Mr Yoffa says after the 30th Finke in 2005, the Chief Minister at the time received advice from some bureaucrats that the Finke may have grown to a size where it was beyond the capability of volunteers. The club was of a different view and soldiered on, working harder to develop the event. Over a decade the club reversed the make-up of competitors from 80% local and 20% interstaters. This year 82% of all competitors came from interstate. The club is supported by NT Major Events who provide assistance worth $60,000 for the big screen at the Alice-end start / finish line, media management and audio visual services. Their Alice Springs event manager also provides logistical support to the event. But the control of the event remains in club hands, and that means, under Alice Springs control. There are, however, significant negotiations with the government about the track, enhancing the safety of the spectators. In the meantime good public relations are the best strategy, says Mr Yoffa. That includes a thank you BBQ in Finke in December to which the whole community is invited. And there’s always the word of mouth from the grid girls (105 applied last year from across the country) and the Finke Heroes, those previously crowned as volunteers of the year supporting this great event. I am surprised that for something that is part of all the locals (among many other people) memories and life experiences that the NT Government aren’t putting more money and effort in making it better and bigger! Come on Giles, chuck some money at it take some credit for making it the best weekend on the Alice Springs calendar (of which it pretty much is anyway)! I’m also very surprised that the prize money is nothing compared to the cost of racing God bless all the competitors and volunteers.